Well, it's got an AT-AT strapped to the top, so pretty big! I wonder if a Deus Ex Machina moment has ever happened because of a previous instance of Deus Ex Machina? That makes it slightly smaller or about the size of a Gozanti? Aha! This is what the next scum epic ship is going to be! Doubtful. 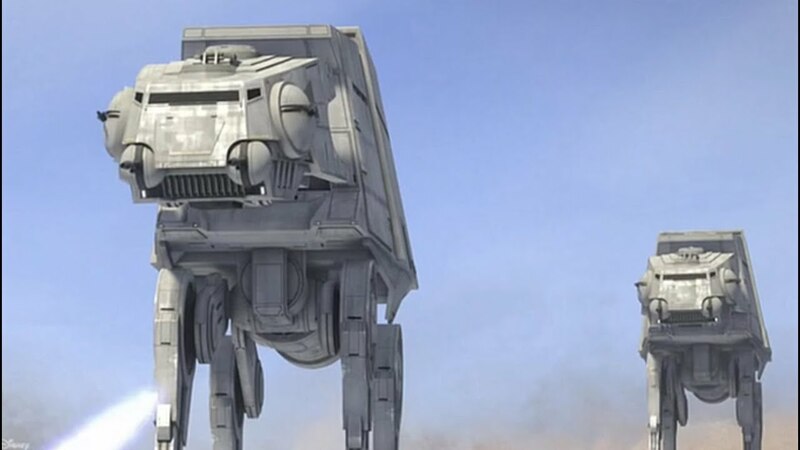 The dimensions for an entire AT-AT is 20 m long by 22.5 m high (2 can fit under the "wings" of the Imp Gozanti without extending outside of their silhouette). The Falcon is over 30m long... If anything this is a fairly heavily armed "light freighter" slightly larger than the Falcon. Barring that just being the nose that is, then you're looking at a largish corvette or frigate. Theres' a later shot that shows the whole thing, and it's much bigger (or at least longer) than what is shown in this shot. You shouldn't. Take a closer look at this AT-AT's canopy. It's the AT-AT from Rebels. Which is actually taller/larger than the one we ended up with, hilariously. 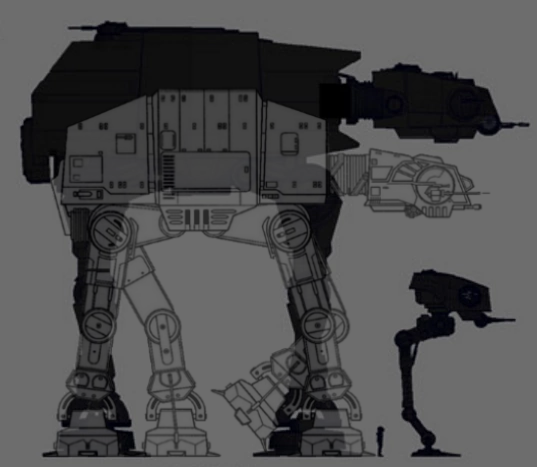 Point is, the AT-AT in Rebels is larger. Its cockpit is the one used. I caught your point and noticed the pilot at the bottom of the right most image, between the walkers, that was placed there by the artist for scale reference... IF that scale figure is supposed to be 1.5m then the AT-AT from Rebels is the same exact size as the Legends dimensions and the proportions of cockpit to the rest of the chassis have not changed... My guestimate is based off of the known Legends dimensions and referenced the proportions of the components in relation to those dimensions. My ref image, as should be obvious from just looking at it since it seems you mirrored and then overlaid the top portion on the image from the Rebels cell art to make your point, did not have a reference figure. It didn't in the original publication of that image either, I owned the book it is from. I was off on the average height then, though I could have sworn I remember 1.5 m being the listed average in SW. Still, thanks. Going to check something with the image using 180 cm as the reference height for the pilot. The width of the cockpit looks to be 1.3 times the height (per the following image) so at 1.5m scale it would be 4.87m, at 1.8m scale it would be 5.85m. Back to the pirate ship Sir Oriin was kind enough to share the still of. Prow: Roughly 4 AT-AT cockpit widths wide, 5 high and 3 long without including the cannons on the ship. So at 1.5m scale: 19.48m wide, 18.75m high, 18m long. At 1.8m scale: 23.4m wide, 22.5m high, 21.6m long. 1.5m scale: Length: 45m - 54m (same unknown since no profile or aft shot, estimating 2.5-3 times the length of the prow). Width: 48.7m (including the fins appears to be about 2.5 prow widths when looking at the vid). Height: 73m (from what I can tell from Sir Oriin's shared image and 0:39 of the preview, the mast to tips of lower fins is half again the width including the fins). 1.8m scale (same qualifiers as the 1.5m scale): Length: 54m - 64.8m. Width: 58.5m. Height: 87.75m. So, uh, z96 is a thing that exists now. Reaper Squadron used them at some point after the Clone Wars. They have markings that distinguish them from z95s. Unless Kaz does not actually know his military history. Interesting. If not a scripting/editing oops it makes me wonder if Incom or Soro Sub decided to market them to system defense forces and only sell the X-Wings, if Incom, to the New Republic military. So, uh, z96 is a thing that exists now. They were mentioned in a Solo cut scene as well. The one where Han is flying a TIE brute and is like," the headhunters would have killed my wingman if I didn't do that" and he gets kicked out of the imperial academy. By headhunters I assumed they ment z95 headhunters. @Hiemfire correct me if I'm wrong. I'll need to watch the clip to see which model designation they give if any. The original Headhunter was the Z-95 and those would have still been around when Han was in flight school. Well, now that we know there are Kaiju living under the platform, it's only a matter of time til Ezra shows up! I got this wrong when first commenting. Kaz actually corrects Neeku (who claims it was a z96), stating that it's Reaper Squadron markings and that "during the Clone Wars, they never used the z96, only the z95." So z96 actually could have existed during the Clone Wars but perhaps was never used by Reaper Squadron, unless "they" was meant to be a more generic statement about the militaries of the clone wars era. We can assume it came after the z95 fairly reasonably, at the very least. I also think it's somewhat safe to speculate that Reaper Squadron existed into the Imperial navy and used the z96 for a time before the GE discontinued the use of the line. I also would take a guess that "headhunter" and "z95" are likely used as a colloquialism for the entire line, though I think Neeku and Kaz are being more technical in this discussion. They were mentioned in a Solo cut scene as well. The one where Han is flying a TIE brute and is like," the headhunters would have killed my wingman if I didn't do that" and he gets kicked out of the imperial academy. By headhunters I assumed they meant z95 headhunters. @Hiemfire correct me if I'm wrong. To be clear, z95 has been a thing in canon for awhile now. I was bringing to attention that an assumed follow-up or variant to the z95 exists, the z96. Some concept art and screenshots from the episode guide showing the Fireball and the salvaged z95, and a shot of a couple of aces from (I think) the Fireball's cockpit viewpoint.